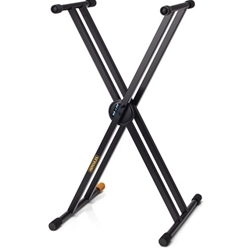 The KS120B Double Braced Keyboard Stand features Hercules EZ-LOK system which allows you to adjust it into one of five height settings without using locking screws or pins. Simply close the stand completely, open it to the lowest level, and raise it back to the height you desire. The KS120B has round and square 1" thick steel tubing and can handle up to 200 pounds.